Direct flights from Dublin to Bari and from Pisa to Dublin. Internal flights from Bari to Catania and from Catania to Florence. Car Rental in Matera, Lecce and Florence. Private return airport transfers in Taormina. Thirteen nights’ accommodation in hand-picked OROKO partner hotels in Matera, Lecce, Taormina and Impruneta. Guided excursions in Matera and central Florence, cooking classes in Squinzano and wine tasting in the Chianti region. Embark on a classic road trip of southern Italy, taking in the beautiful Mediterranean landscape, rolling hills and lemon groves. Start by visiting Italy’s ancient cities of Lecce and Matera, admiring the unique villages of Puglia along the way. 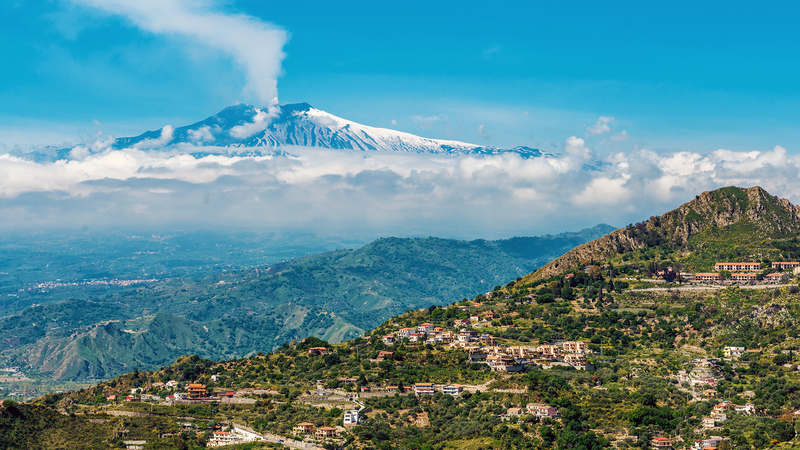 Break up the road trip with a short flight to Taormina to relax and unwind at some of Sicily’s most beautiful beaches. 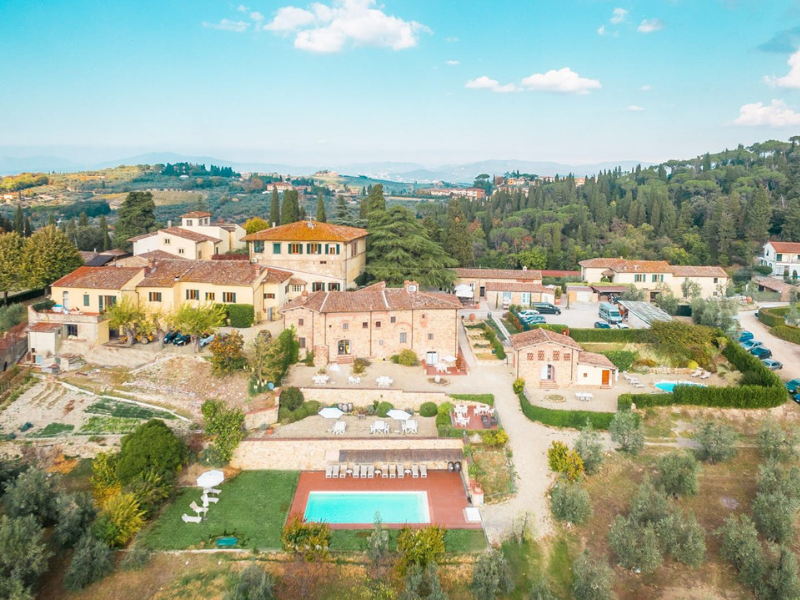 Then, finish your road trip in the Chianti wine region, winding through the cypress-lined roads, passing country estates and beautiful vineyards. Fly from Dublin Airport to Bari Karol Wojtyla Airport. Upon arrival, collect your rental car and drive to the UNESCO World Heritage Site of Matera Sassi. You will spend three nights in the chic Aquatio Cave Luxury Hotel & Spa. Relax and unwind in the underground spa, a unique space where the sauna, swimming pool and Turkish baths are all carved into the natural stone. 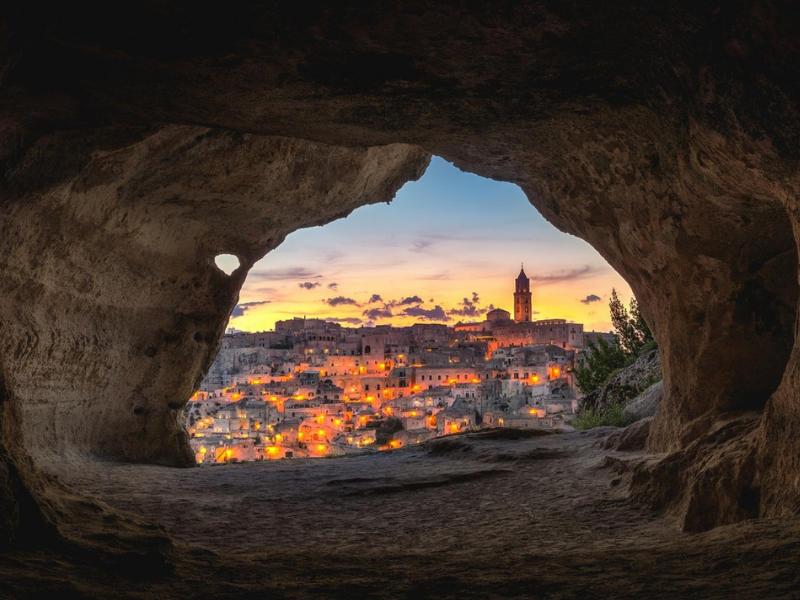 Embark on a fascinating tour of the historic centre of Matera, one of the oldest continuously inhabited cities in the world. This private tour is enjoyed from the back of a quirky Ape Calessino, the Italian version of a tuk tuk. Explore the winding streets and alleys, the Church of San Francesco d’Assisi and Matera Cathedral. Take a scenic drive towards the ancient city of Lecce. Upon arrival, check in to La Fiermontina Urban Resort for your two-night stay. Relax by the pool in the private 17th-century estate gardens and enjoy traditional Pugliese cuisine in the hotel restaurant. Enjoy an exciting cookery class in Squinzano. 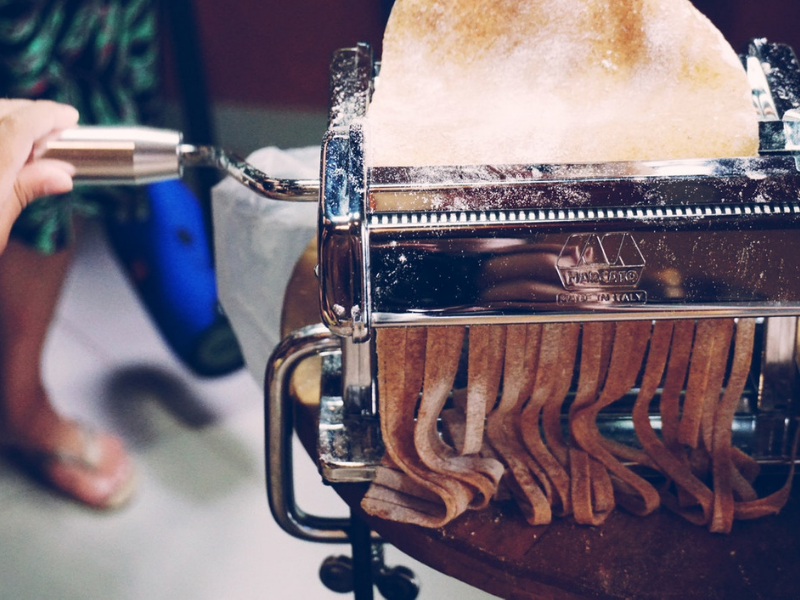 You will learn how to make a traditional four-course Italian meal including the preparation of antipasti and classic desserts. Afterwards, enjoy your creations together over a glass of local wine. 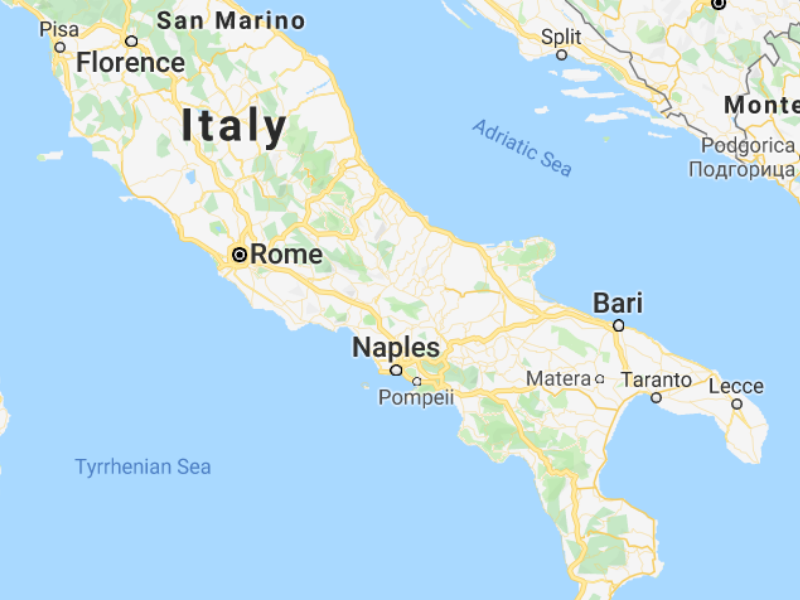 Drive to Bari Airport and take a flight to Catania-Fontanarossa Airport. Upon arrival, you will be privately transferred to our partner hotel in Taormina. Check in to Eurostars Monte Tauro for your four-night stay. Relax on the panoramic terrace, looking out on superb views over the Ionian Sea. The centre of Taormina is just a few minutes’ walk away, where there are endless boutiques and restaurants to explore. 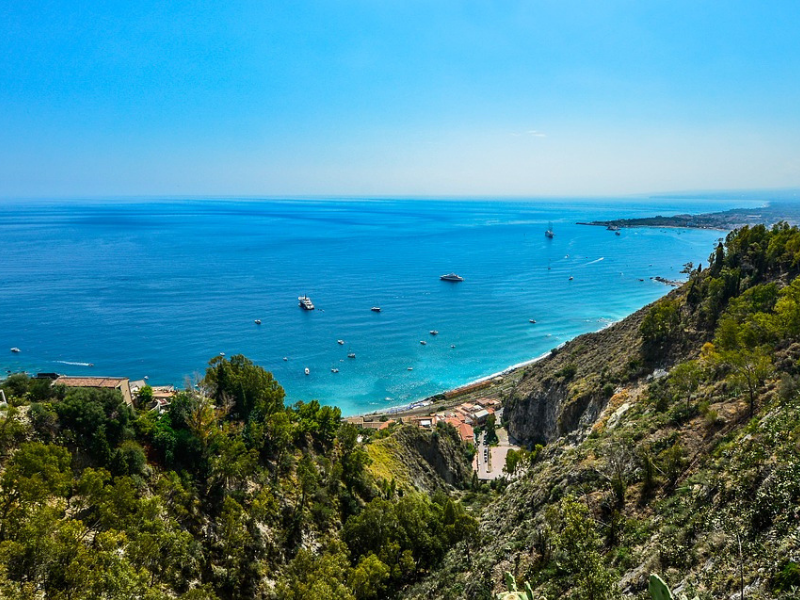 Relax and unwind in the Sicilian sunshine on Taormina’s beautiful beaches. Isola Bella, a charming little beach at the foot of the town, is loved for the beautiful surrounding fauna and turquoise blue waters. The magnificent islet of Isola Bella is connected to the mainland by a narrow strip of beach. 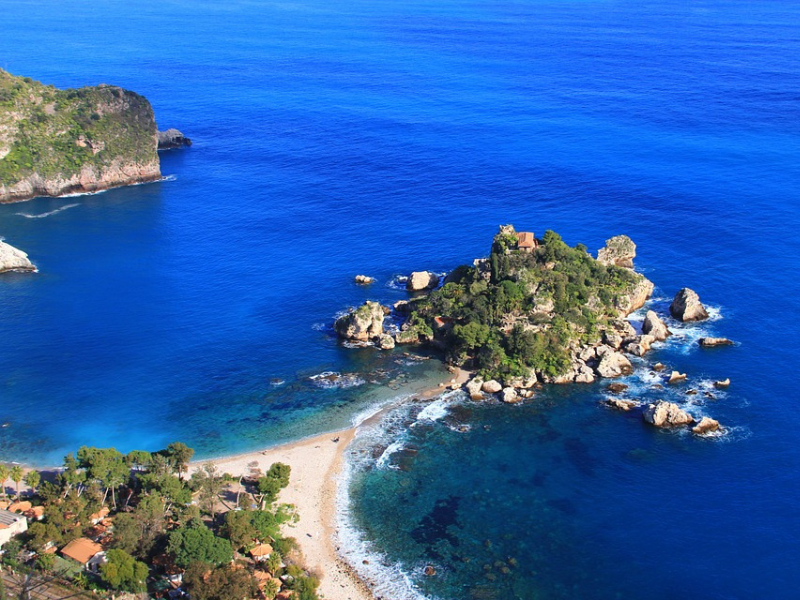 Giardini Naxos and Mazzarò are two more stunning beaches in Taormina. After a short break in Taormina, you be privately transferred to Catania Airport, where you will take a flight to Florence Airport. 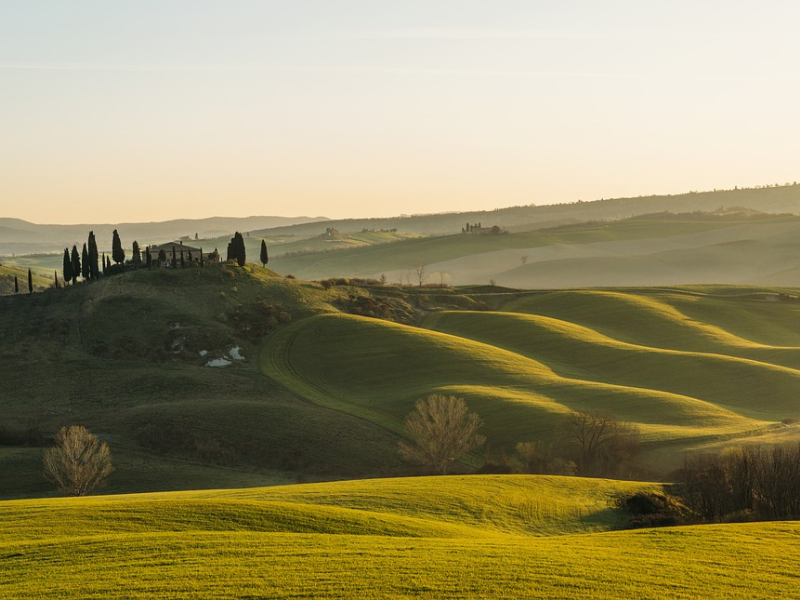 Collect your rental car and take a scenic drive through the Tuscan countryside until you reach the small village of Impruneta. Check in to our partner hotel, Relais Villa Olmo, for your four-night stay. 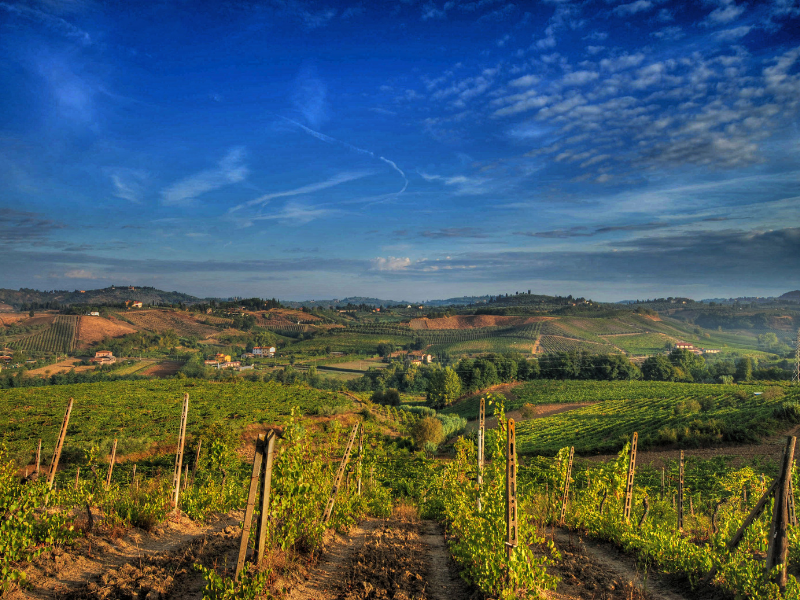 Situated on the Florentine hills, it is a gateway to the Chianti region, offering a real taste of rural Italy. Take full advantage of your escape to the countryside with wine tastings, poolside relaxation and walks through the vineyards and olive groves. Allow us to organise excursions to suit your tastes as well as restaurant reservations at some of our favourite eateries. Enjoy a memorable tour of central Florence and the Uffizi Gallery with a private guide. 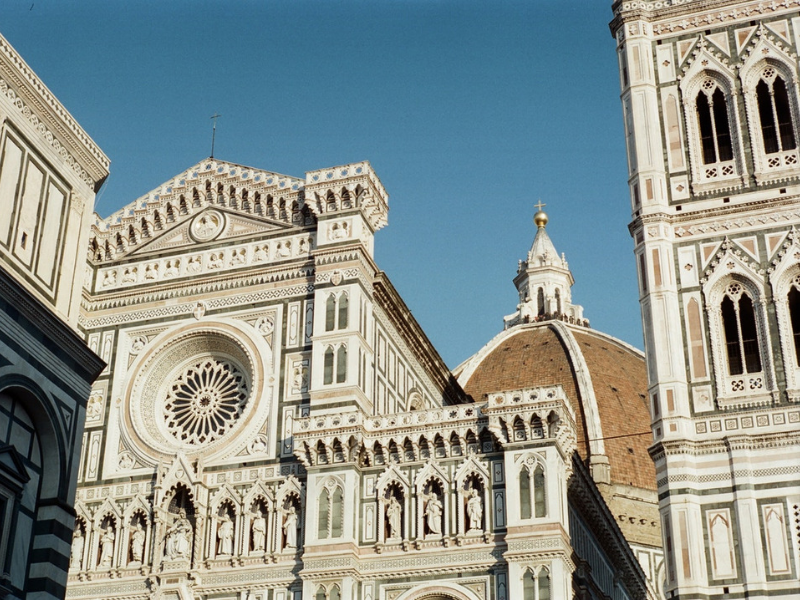 Known as the cradle of the Renaissance, Florence is wonderfully preserved with a wealth of Renaissance art and architecture to admire. Today, you will witness the fabulous works of art by artists like Botticelli, Da Vinci, Michelangelo and Rembrandt. 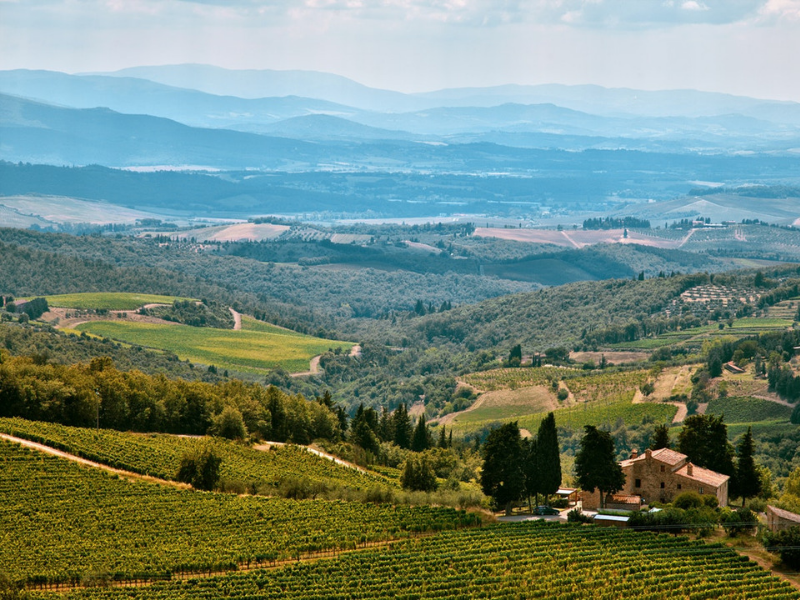 Embark on an exclusive wine tasting tour in the Chianti region. With your private guide, tour the vineyards, historic cellars, Renaissance gardens and the ‘Panoramic Mona Lisa Terrace’. After the tour, enjoy a Mediterranean lunch in the castle and an exclusive tasting of the four classic Chianti wines. Drive to Pisa International Airport for your direct flight home. On the Florentine hills, at the gateway to the Chianti region, Relais Villa Olmo offers a real taste of rural Italy. Situated within an agricultural estate and surrounded by vineyards and olive groves, this property is the ideal escape to the countryside. Guests can avail of the complimentary shuttle buses to and from the city. There is a swimming pool for guests to relax and enjoy the peace and quiet of the countryside. The Eurostars Monte Tauro is a stylish, modern hotel set into the cliff face of Taormina. 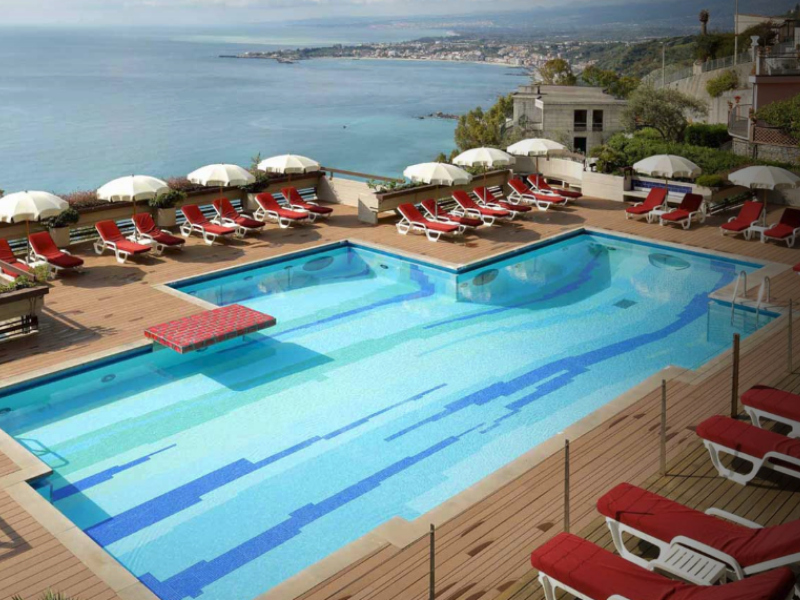 From the hotel pool, enjoy fantastic views along the entire coast and Mount Etna in the distance. The centre of Taormina is just a few minutes’ walk away and there are many restaurants and bars in the vicinity. 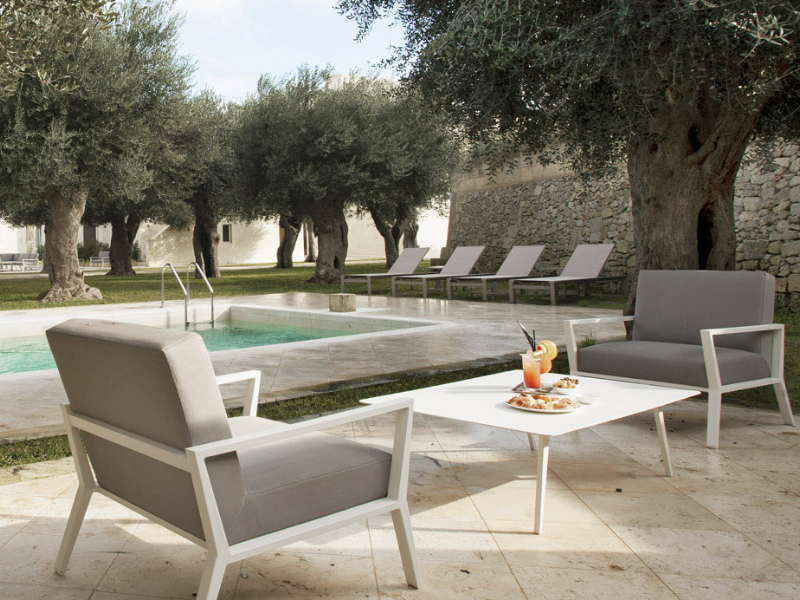 La Fiermontina is a stylish boutique property located just outside the ancient walls of Lecce. The 17th-century private garden shares its walls with the ancient city, just a short walk from the central Piazza Sant’Oronzo. 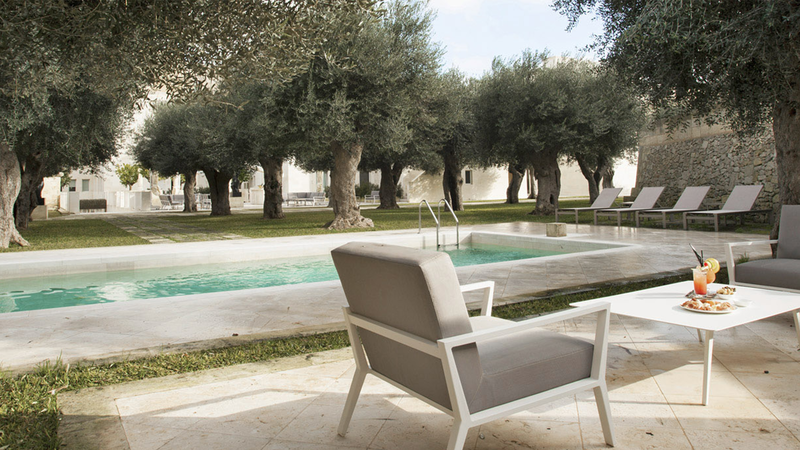 The outdoor pool is situated within the sculptured garden and surrounded by beautiful olive trees. 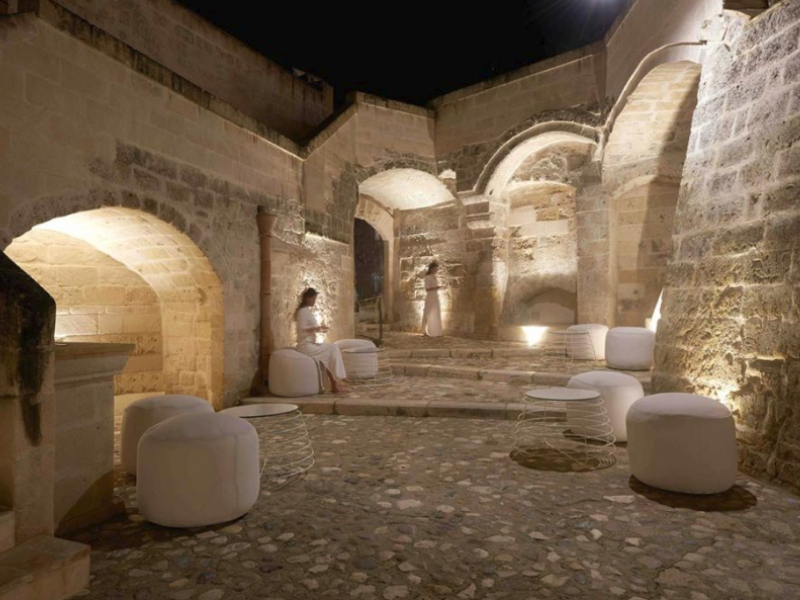 Aquatio Cave Luxury Hotel & Spa is situated within the UNESCO World Heritage Site of Matera Sassi. Rooms, designed by famous architect Simone Micheli, are modelled on the ancient grottos, creating a unique style of accommodation for guests. The spa is built underground and the sauna, heated swimming pool and Turkish baths are all carved into the natural stone.